In November 2011, a draft National Development Plan (NDP) was released that addresses two of South Africa's major challenges: poverty and inequity. Health and economic development are interdependent, presenting an important opportunity through the NDP to integrate health within goals of broader socioeconomic development. Reviewing the NDP identified gaps based on evidence and the epidemiological risk profile of South Africa. 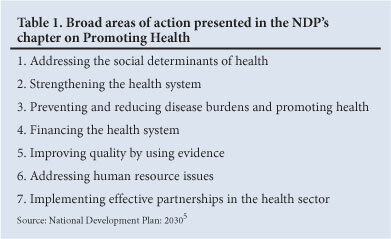 Recommendations to improve the NDP and to deal with poverty and inequity should focus on prevention and addressing the social determinants of health, including: (i) a multisectoral approach to establish a comprehensive early childhood development programme; (ii) fiscal and legislative policies to bolster efforts to reduce the burden of non-communicable diseases; (iii) promoting and maintaining a healthy workforce; and (iv) promoting a culture of evidence-based priority setting. Achieving the goal of 'a long and healthy life for all South Africans' will require healthy public policies, well-functioning institutional and physical infrastructure, social solidarity, and an active and conscientious civil society. South Africa is one of the most unequal societies in the world;1 its degree of economic disparity is matched by substantial developmental challenges and (germanely to this article) health inequalities. Notwithstanding the high average under-5 mortality rate, the mortality rate of children from the poorest households is 4 times that of the wealthiest.2 Similarly, nearly 20 years after the 1994 change of government, black South Africans have an average life expectancy that is 18 years less than that for whites.3 Such facts warrant reflection and urgent action. The recently launched National Development Plan (NDP): 2030 should offer some guidance for improving the situation. The National Planning Commission (NPC), a group of experts from a wide range of disciplines under the chairmanship of Minister in the Presidency Trevor Manuel, was established in 2010 to address inequity and poverty. These were identified as the 2 major challenges facing South Africa.4 This progressive approach by government to identify and tackle challenges to South Africa's prosperity culminated in 2011 with the release of the draft NDP for public comment.5 The NDP includes a chapter on Promoting Health, with other chapters on topics ranging over education and the economy, social protection and building a capable state. Ensuring the achievement of a 'long and healthy life for all South Africans'6 requires more than addressing the pervasive challenges of the health system. A fundamental shift to address the 'causes-of-the-causes' of disease and preventing disease as far as possible through the development of healthy public policy must play a central role. Advocacy by healthcare professionals regarding the social determinants of health, and promoting an understanding of health as a social phenomenon, will aid in developing public policy and thereby improve health. Social determinants can be divided into structural and intermediary determinants.8 Structural determinants result in social stratification based on arbitrary characteristics (e.g. gender, race, ethnicity, sexuality, place of birth and religious belief) and are enforced by social, political and economic policies;8 apartheid is an example. These factors result in an inequitable distribution of power and access to resources, and an increase in vulnerability of certain population groups in terms of their respective socio-economic positioning.7 Intermediary determinants compound this inequity and result in vulnerable groups being less able to deal with adversity owing to their absolute or relative material deprivation.7,8 Intermediary determinants are related to, and stem from, the structural determinants. Consequently, a differential exists in the exposure to risk factors for disease, the ability to adequately address these risk factors, and an ultimate differential in wellness. These differentials are mostly as a result of factors outside the formal health system. 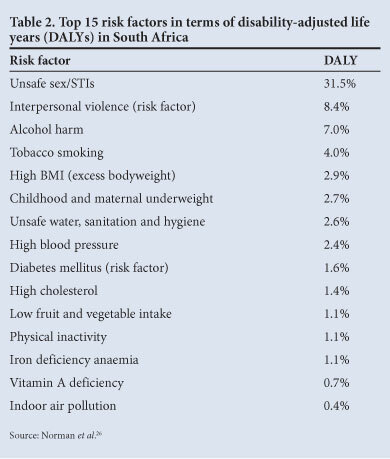 In South Africa, poverty and inequity are the major social determinants of health. Whereas adequate and equitable funding for health services is important, the solutions to address social determinants are more nuanced. Similarly, economic development alone will not improve health if resources are inequitably distributed.9,10 Within the framework of the social determinants, we reviewed the NDP to identify gaps and suggest a broader approach. Current activities of the Department of Health (DoH) are well integrated into the document, which provides for continuity of the current strategic direction. However, the NDP does not sufficiently challenge the DoH to further concretise and extend its focus. Despite the social determinants and prevention having been mentioned as targets, the chapter on Promoting Health does not explicitly address the up-stream factors or provide population-level preventive strategies. More importantly, none of the other chapters address health as an aid to achieve a reduction in inequity and poverty. The most important omission in the NDP is the lack of integration among its chapters. The Plan follows the organisational trend of vertical and compartmentalised government services, with the health and other chapters being presented in 'silos'. Since the overarching goal of the NDP is to provide a broad cross-departmental, inter-sectoral approach,5 it must develop a well-integrated plan with a common thread to guide future department-specific strategies, i.e. to guide each department on specific policy and provide the basis for future 'joined-up' governance. This is essential for addressing the inequities that have remained since 1994. The NDP outlines the long-term goals and objectives for South Africa; our recommendations and suggestions focus on aspects that would help to steer the course towards improved population health. Informed by evidence from the literature and the epidemiological risk profile of South Africa, we propose that the following key recommendations be included in the final NDP: (i) a multisectoral approach to establish a comprehensive early childhood development programme; (ii) fiscal and legislative policies to bolster efforts to reduce the burden of non-communicable diseases; (iii) promoting and maintaining a healthy workforce; and (iv) promoting a culture of evidence-based priority setting. Exploring fiscal and legislative measures to aid in addressing risk factors (Table 2) and resultant disease burdens should form part of the NPC's strategy to promote health and prevent disease. Regulatory and fiscal interventions are effective15-19 even in resource-poor settings.20 New draft legislation on alcohol and tobacco21,22 are commendable steps to decrease risk at population level. However, more is required, and the NPC should endorse this approach and provide recommendations on future strategies. Alcohol, tobacco, unhealthy diets and injury are major risk factors fuelling the growing non-communicable diseases (NCDs) burden.23-25 Their amelioration at population level requires regulatory and fiscal intervention, which are outside the exclusive statutory mandate of the DoH. Urgent action is required to regulate South Africa's food environment.27 Multifaceted regulations on foodstuffs high in fats and salt, and calorie-dense foods, should be introduced, including food labelling, advertising restrictions and the subsidising of healthy foods. Draft legislation for salt and fat is in progress, and this work should be extended.27 Introducing relevant programmes (e.g. community-based exercise initiatives) could complement these regulatory initiatives, resulting in the promotion of healthier lifestyles among South Africans. Resources for financing healthcare are generated through the economic activities of the citizens of the country. As productivity increases, economic growth increases and more funds may become available for health. However, a healthy population and workforce is both a pre-requisite for economic development and a result of economic growth.29,30 As economic policy and health are inextricably linked, they should not be seen as competing for priority or resources. While job creation is at the top of the agenda in SA, the NPC should prioritise occupational health. Evidence-based priority setting and policy development should be used and promoted by the NPC. Ensuring rational, effective and efficient use of scarce resource requires data on burden of disease and economic evaluation. Institutionalising evidence-based decision-making will help to improve population health benefits and, by making more explicit the basis for decisions, promote public spending accountability. Life expectancy in South Africa is 54 years, some 18 years less than that in Brazil, despite spending the same per capita on health.31 Increased spending to provide access to quality care must be complemented with evidence to navigate difficult choices in a complex environment. Mexico has shown the benefits of a priority-setting, evidence-based approach in healthcare reform.32 Data, methods and evidence on effectiveness and equity of health interventions are becoming available, but gaps persist between this evidence and the application of constrained public health budgets. International economic uncertainty makes it prudent for South Africa to take measures to insulate itself from external shocks. To achieve this in a globalised world, in part requires anticipating and minimising domestic shocks, e.g. the HIV epidemic that has had major economic implications for sub-Saharan Africa.33,34 The insidious rise of the NCD burden25 will have similar long-term consequences for future growth and resource availability. Averting future economic losses and ensuring a sustainable NHI requires explicit demand-side considerations to achieve an absolute and sustained reduction in the NCD burden built on prevention. Healthy public policy is a necessary, but not a sufficient, component to ensure the welfare of citizens. Policy must be complemented with institutional and physical infrastructure that will ensure its enforcement and regulation to achieve tangible benefits. Our social responsibility as civil society and as health practitioners is to engage with policy makers and implementers at all steps to ensure that we achieve the goal of a 'long and healthy life for all South Africans'.